Mine: BAD. A great cast, a great book, a relly bad movie. Way too long. It never gets any energy. A movie about the 80's was maybe made to soon after the 80's. 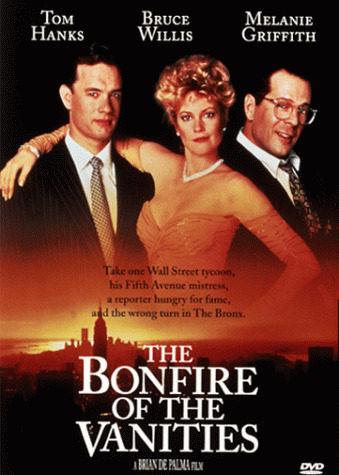 Leonard Maltin/Plot synopsis: Appallingly heavy-handed ``comedy'' about a cocky Wall Street wheeler-dealer whose well-insulated life begins to crumble when his wife learns he's fooling around, and he and his paramour are involved in a hit-and-run accident. With all the power--and nuance--of Tom Wolfe's novel removed, and all the characters turned into caricatures (racist and otherwise), what's left is a pointless charade, and a pitiful waste of money and talent. F. Murray Abraham appears unbilled as the Bronx D. A. Super 35.